WITHERS Jones Mitchell (1814-1890) was a United States Army officer who fought during the Mexican–American War and later served as a Confederate major general during the American Civil War. He also was a lawyer, politician, and businessman from the state of Alabama. War-date Confederate Special Orders Signed “Jno. Withers” AAG, 1pp. quarto, Adjutant and Inspector General’s Office, Richmond, Virginia, August 22, 1862, and reads in part: “...The reports of Fort Donelson disaster having now been received and considered, it is impossible to acquit Brig. 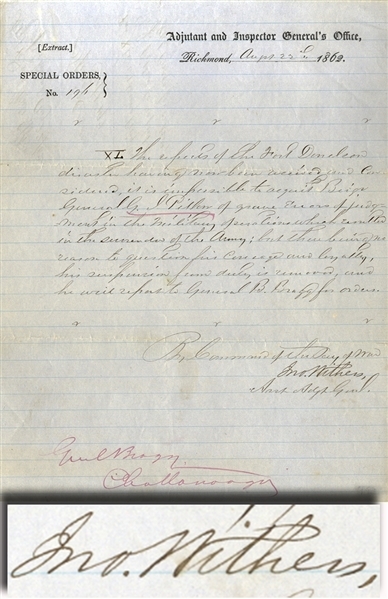 Gen. G. J. Pillow of grave errors of judgment in the military operations which resulted in the surrender of the Army, but there being no reason to question his courage and loyalty, his suspension from duty is removed, and he will report to General B. Bragg for orders...” Fine condition.